We commit our resources towards next generation security research which is often many years ahead of the security industry but valid and necessary right now. Our research has a broad reach as it brings together multiple disciplines to gain a deeper understanding of how our security is influenced physically, culturally, socially, and psychologically. Most of all we want the research we do to mean something and to make sense of security. We want to be sure that a person who is ISECOM certified is exactly the kind of person you want working on your security. Our certifications provide an unequaled assurance of practical resourcefulness, cutting-edge security know-how, and the appropriate and required skill set to do the job under pressure. We need to make sure the security professionals today are ready for the world of tomorrow. Our partnerships are bridges between our research and the solutions needed today. Our partners provide the means for us to reach into different countries, cultures, and industries. Therefore we want partners who are responsible in their business and capable of representing us in their region. To help you do that we offer a variety of different types of partnerships to accommodate different levels of interest in our work. We are immersed in a constant state of research of which only some can be released publicly. The rest is maintained in a repository to springboard new research, enhance our trainings, and support the needs of clents. This exclusive repository includes templates, checklists, sample reports, alpha and beta drafts of methodologies, research        notes, and presentations in editable formats. By subscribing you get the newest documents, better tools, new ideas, and a place in a unique and productive security research community. 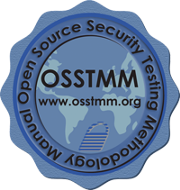 Back in January 2001, ISECOM began with the release of the OSSTMM, the Open Source Security Testing Methodology Manual. It was a move to improve how security was tested and implemented. Many researchers from various fields contributed because they saw the need for an open method, one that was bound towards truth and not commercial gain or political agendas. This is also true for all of the research areas covered by ISECOM projects. And it's not enough to just find the facts, we need to find ways to apply it to the world we live in. So it needs to be a security philosophy and it needs to make sense. And that's what ISECOM does every day for millions of people around the world. From governments to businesses to schools to just regular people, we help to make sense of security.